Types of lions include-African lions, Asiatic lion, American Lions, Mountain Lion, Cave lion, Leopard, White lions are rare. The golden lions, each about six feet long, greet each other by rubbing up against each other. They keep in touch with roars, growls, grunts, meows and moans. Earliest fossils of lion-like ancestors date from 1.5 million years ago. Once there lived even bigger lions on earth, the American Lion (Panthera leo atrox) in America and the cave lion (Panthera leo spelaea) in Eurasia.A tawny body. White lions have been recorded (although not true albinos) while the black form - as seen in leopards and jaguars for example - has never been observed. Unlike the slitted pupil in the eyes of domestic cats, lions have a round pupil like humans. Lions are the only cats to have tufted tails and male lions the only cat to have a mane.Lions are the only members of the cat family to live in prides. This is made up of a group of females, all related to each other, and their cubs. There is no dominant female. The pride is led by a single dominant male or a coalition of males. The males are highly social and will hunt and scavenge together, whether they are in charge of a pride, or whether they are a group of young males living alone. If the males are living and working together as a pair they tend to be unrelated; large groups tend to be related to each other. The roles of the males and females are quite different. Females tend to do all the hunting for the group while males expend a great deal of energy protecting their pride from outside males. Sometimes a male will only be in charge of a pride for two years. However, groups of males are more successful and can remain in control for four-five years. Fluid requirements - although lions drink regularly when water is available they are capable of getting the necessary moisture from their prey - and even from plants. Lions in the Kalahari desert have been seen eating tsama melons. GESTATION - 110 days-OFFSPRING - generally 2 - 3 cubs. LONGEVITY - In the wild males generally live for 12-16 years, females 1-5-16 years. In captivity lions can live up to 25-30 years. The lion formerly ranged from northern Africa through southwest Asia, west into Europe and east into India. However, it became extinct in Europe about 2,000 years ago; and there is only a relict population of about 350 animals left in the Gir Forest in India. 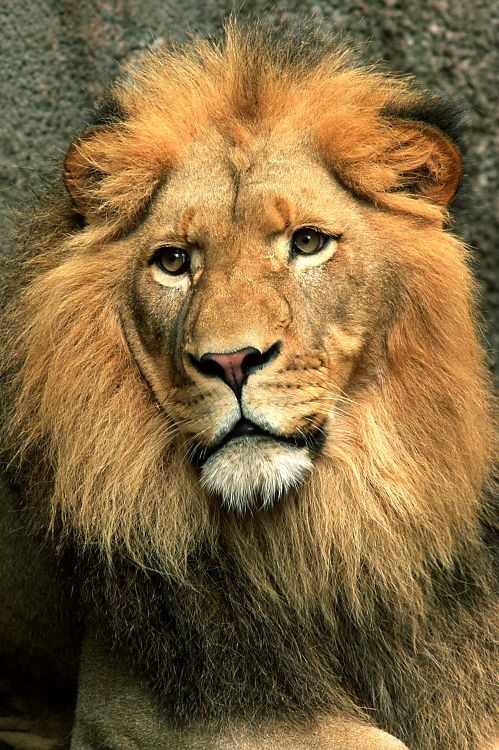 The lion has also declined in Africa in the last 150 years. Today it is estimated there are between 30,000 - 100,000 lions, mainly in east and southern Africa; in west Africa numbers have greatly declined. In African lions the mane is very thick and usually covers the ears (unlike the mane of the Asiatic lion, where the ears can be seen). It is thought that the heavy mane protects males when they are fighting. It can also emphasise his powerful size and show off the good state of his health to opposing males without wasting energy in supporting an increased body size. Mane development is influenced by testosterone and, in captivity, castrated male lions will lose their mane.Throughout most of Africa, lions are becoming increasingly rare outside protected areas. Cattle culture is widespread and lions are seen as a threat to stock and are shot or poisoned. As scavengers, lions will also pick up poisoned meat meant for other harmful predators. The cheetah is the fastest land animal in the world. There are two types of Cheetahs. The most common Cheetah is the Acinonyx Jubatas, which lives in the open grassland of Africa. It once ranged across Asia to India. Then there is the King cheetah that is found in Rhodesia. The Cheetahs range from 4 1/2 to 5 feet long in length they have a 2 to 2 1/2 foot long tail. They stand 3 feet tall at the shoulder, and they weigh from 110 to 145 lbs. The Cheetahs have tawny or sandy-brown fur. The King Cheetah has black stripes but, the common Cheetah has spots. The Cheetahs have short fur except around the neck. The Cheetah's long tail helps the Cheetah to turn and it's claws are more like a dog's claws than a cats. The Cheetahs rests among the rocks or tall grass. The Cheetah hunts during the day and it likes medium or small size antelope. The Cheetah stalks it's prey then, goes for the kill. The Cheetah, at it's top speed, can go 45mph per two seconds. At it's full speed it can run up to 70mph. They can not ran at this speed for more than a few hundred yards though. The Cheetah was tamed and trained to hunt. This was done for century the rajahs of India. The Cheetah is mostly solitary animal. The largest group of Cheetahs seen together is 3. The Cheetah's have no fixed breed season. The females usually have twins 84 to 95 days after mating. The Baby Cheetah's are born with long gray fur that has no spots. When they are 3 months old the Cheetah's get a new coat of fur and all the baby fur is shed. The average life span of a cheetah is 15 years. These cats are playful and friendly. They can be tamed and they purr like a housecat when content. The Cheetah has never been known to attack a human. high mountain leopards - even darker in color than 3). Few animals match the rare beauty and quiet mystery of the snow leopard. Seldom do people see these animals in the wild: elusive and solitary, they live in remote pockets of central Asia. There are perhaps 6,000 snow leopards left in the wild. The number is difficult to estimate since snow leopard terrain is rugged and researchers must rely on indications of the animal rather than direct sightings. Central Asia contains the largest concentration of mountains in the world. These mountains are the home of the snow leopard, which has been known to occur in twelve different countries: Afghanistan, Bhutan, China, India, Kazakhstan, Kyrgyzstan, Mongolia, Nepal, Pakistan, Russia, ajikistan, and Uzbekistan. Borders between these countries are often along mountain ranges -- the same high mountain ranges are also the abode of the snow leopard. 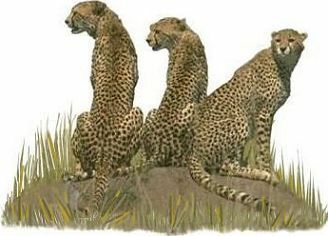 Early forms of the cheetah are also believed to have inhabited North America as far back as 2? ?llion years ago (Acinonyx studeri) to as recently as 12,000 years ago in the smaller form of Acinonyx trumani. The early ? World?rm, Acinonyx pardinensis found in Europe, closely resembled the modern day cheetah apart from being noticeably larger. The jaguar is the only member of the genus Panthera (big cats) to be found in the Americas where it is considered the New World equivalent of the leopard. Its coat is basically yellowish-brown but can vary from almost white to black. Its back is marked with dark rosettes and the lower part of the tail is ringed with black. Jaguars weigh anywhere from 90-120 kg (males) and 60-90 kg (females). Range: Historically, jaguar ranged from the southern United States through Central America to Venezuela, the Guianas, and Brazil. The former United States distribution included southern California, New Mexico, southern Arizona, Texas, and possibly Louisiana and Colorado. Unfortunately, the jaguar is now extinct in Uruguay and virtually extinct in the United States, most of Mexico and Argentina, and the developed areas of Central and South America. Current distribution is in a broad belt from central Mexico through Central America and into South America as far south as the northern portion of Argentina. The last confirmed sighting of a jaguar in the United States, was on March 7, 1996 in New Mexico's Peloncillo Mountains, about 6 miles from the Mexico border. 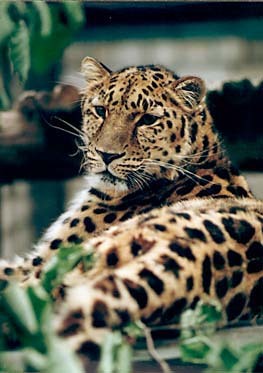 Habitat: Jaguar habitat requirements include dense cover (forest, brush, grass) water, and sufficient prey. In general, they occur in a wide variety of tropical habitats, ranging from montane forest and wet savannah to tropical rain forest and deciduous tropical forest. They are especially common near rivers, streams and lagoons and have been known to use roads and trails for travel and hunting. Diet: Although known to feed on large prey such as deer, tapir, and peccary, jaguars are opportunistic feeders often feeding on smaller animals, like capybara, sloths, armadillos, and fish. Social Organization: Data suggest that jaguars are predominantly solitary. Unlike other solitary cat species; however, home ranges may occasionally overlap. It is suggested that in areas of high prey density, jaguars can share limited ranges. Conservation Status: Despite the historical lack of precise population estimates, jaguar are known to be rare or extinct in many parts of their former range. Estimates indicate that the total current wild population is greater than 10,000; however, several subspecies are reported as rare. The United States population consists of only isolated stray animals crossing the Mexico/U.S. border. Jaguar are listed as endangered by USDA, Appendix I by CITES and Vulnerable by IUCN. Threats to Survival: Threats to the jaguar include habitat loss, hunting, and development throughout their range. Hunting and export are still allowed in some Central American countries and restrictions in other countries are poorly enforced; even if hunting is prohibited. Loss of forest habitat is a major concern for the decline of the species as estimates of deforestation rates in Latin America are among the highest in the world. Birds are warm-blooded vertebrate animals that have wings, feathers, a beak, no teeth, and strong, hollow bones. Not all flying animals are birds; bats, pterosaurs, and flying insects are not birds. Bird locomotion is quite varied; most can fly, some can run very well, some swim, and some do combinations of these. Some birds cannot fly. Birds spend most of their time looking for food. Some birds, like owls and eagles, are carnivores (meat-eaters). Some birds, like the hummingbird, grouse, and Canada goose, are herbivores (plant-eaters). Other birds, like starlings, are omnivores (plant and meat-eaters). Birds mostly use their keen eyesight to find food. They use their beak and their claws to get bugs, worms, small mammals , fish, fruit , grain, or nectar. Birds play a very important part in the natural control of insects and in the dispersal of seeds. Some birds, like the tiny, nectar-eating hummingbird are important pollinators of some flowering plants. Birds bear their young in hard-shelled eggs which hatch after some time. Some birds, like chickens, lay eggs each day, others (like the maleo) may go for years between laying eggs. The incubation period of bird eggs varies from species to species. There's also some variability due to the temperature. Some birds, like cuckoos and some cowbirds, lay their eggs in other bird's nests. The non-related adult bird takes care of the cuckoo's egg unwittingly. Some cuckoos even kill the other eggs in the nest to insure that their egg gets enough food. Birds belong to the biological class Aves and live virtually everywhere on Earth. Birds are amniotes, animals whose eggs are protected from drying out (a group that includes the mammals, birds, dinosaurs, and reptiles). There are about 9,000 different species of birds, divided into 24 orders and 146 Families. Most birds alive today are Neognathae (a group distinguished by common palate structure). Another, much smaller group, is the Palaeognathae (again grouped by palate structure), which include the ostrich, kiwi, emu, rhea, and others. Birds probably evolved from meat-eating (theropod) dinosaurs during the Mesozoic Era, roughly 150 million years ago. Birds breath using a unique system in which air follows a one-way route through the respiratory system. This system is unlike our lungs, in which the air backtracks where it came from. Their system of respiration (breathing) is very efficient - much more efficient than ours ststem. Bird fossils are rare because bird bones are hollow and fragile, but Jurassic, Cretaceous, Eocene and Miocene-Pliocene bird fossils have been found. The Archaeopteryx is the oldest known fossil bird, now extinct. It dates from about 150 million years ago during the late Jurassic period. Although Archaeopteryx had feathers and could fly, it had similarities to dinosaurs, including its teeth, skull, and certain bone structures. The first Archaeopteryx fossilized feather impression was found in 1860 in a limestone quarry in Germany. A year later, a much more complete fossilized Archaeopteryx was found at the same quarry. Impressions of its feathers and bone structure were quite clear. More have been found since. In 1868, Thomas Henry Huxley interpreted the Archaeopteryx fossil to be a transitional bird having many reptilian features. Along with Compsognathus, a bird-sized and bird-like dinosaur, Huxley argued that birds and reptiles were descended from common ancestors. Decades later, Huxley's ideas fell out of favor, only to be reconsidered over a century later (after much research and ado) in the 1970's. Many birds have become extinct because of competition for habitat and food, predators, exposure to harmful chemicals, etc. Birds as a group have been in a gradual decline since they reached a peak about a quarter to a half a million years ago. The fossil record of early birds is very incomplete because their bones are so fragile and don't fossilize well. Also, feathers don't fossilize very well, so no one really knows what these extinct birds looked like; these reconstructions are based on educated guesses. Below is a listing of some extinct, early birds. Archaeopteryx (meaning "ancient wing") is a very old prehistoric bird dating from the Jurassic period, about 150 million years ago. It had teeth, feathers, three claws on each wing, a flat sternum (breastbone), and a long, bony tail. Eoalulavis was the earliest bird that had good maneuverability while flying, even at low speeds (this extra flight control is obtained from a tuft of feathers on the thumb called the alula - it also helps in takeoffs and landings). Fossils have been found in Spain. Hespornis (meaning "western bird") was an early, flightless bird that lived during the late Cretaceous period. This diving bird was about 3 feet (1 m) long and had webbed feet, a long, toothed beak, and strong legs. Although it couldn't fly, it was probably a strong swimmer and probably lived near coastlines and ate fish. Fossils have been found in North America . (pronounces eye-BER-oh-mes-OR-nis) Iberomesornis (meaning "Iberian=Spanish intermediate bird") was a small, early, toothed bird that lived during the early Cretaceous period. It was capable of powered flight. It had tiny, spiky teeth in its beak and was the size of a sparrow. Its hip was primitive compared to modern birds; its ilium, ischium, and pubis were all parallel and directed backward. Iberomesornis was named by paleontologists Sanz and Bonaparte in 1992. Fossils were found in Spain. The type species is I. romeralli. (pronounced mon-NON-i-kus) Mononykus (meaning "single claw") was a small, insect-eater from the Late Cretaceous period, about 72 million years ago. Mononykus was either a bird-like dinosaur (an advanced theropod) or a primitive bird; it possessed qualities of both groups of animals, and there is much scientific debate over which it is. Mononykus had short arms with one long, thick clawed finger on each hand (hence its name). It was lightly built, had long, thin legs, and a long tail. Mononykus was roughly 28 inches (70 cm long). A fossil was found in SW Mongolia in 1923 (and originally called Mononychus). Mononykus was named by Perle, Norell, Chiappe, and Clark in 1993. The type species is M. olecranus. (pronounced pat-ah-GONE-eh-kus) Patagonykus (meaning "Patagonia claw") was a lightly-built meat-eater with a single, clawed finger on each hand. It was about 6.5 ft (2 m) long. It had long legs, a long tail, and short arms. Patagonykus lived during the late Cretaceous period, about 90 million years ago. Patagonykus was either a bird-like dinosaur (an advanced theropod) or a primitive bird; it possessed qualities of both groups of animals, and there is much scientific debate over which it is. Patagonykus was similar to Mononykus. Fossils were found in Patagonia, a region of southern Argentina. The type species is P. puertai. Patagonykus was named by paleontologist F. Novas in 1996. Teratornis (meaning "monster bird") was an early condor-like bird. This giant, extinct predator had a wingspan of roughly 16-25 feet (5-7.6 m). This carnivore (meat-eater) dates from the Pleistocene epoch, about 1.8-.01 million years ago. Classification: Class Aves, Order Ciconiformes, Family Teratornithidae (teratornis), Genus Teratornis, species merriami and incredibilis. Owls are classified as belonging to the order Strigiformes, a group which is most closely related to nightjars, cuckoos, and swifts. The order is divided into two families: Tytonidae or Barn Owls and related species, of which there are up to 18 species known, and Strigidae, to which the remaining 108-194 Owl species belong. Look into the face of any Owl and you will be left in little doubt that vision is important to these birds. Huge staring eyes will fix their gaze upon you, giving the bird an air of benign wisdom or malevolent hatred, depending on the Owl's mood. 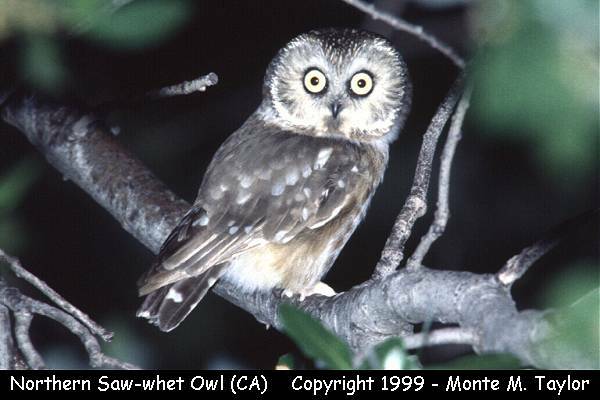 The eyesight of Owls is legendary, particularly their ability to see in near darkness. Recent studies have shown, however, that their vision is not quite as acute as was once supposed. It would appear, in fact, that the Owl's vision and hearing work in harmony. An Owl's eyes are, in effect, fixed in their sockets. They face forward and provide a wide angle of vision, the overlapping field of view providing binocular, stereoscopic vision. Having eyes fixed in their sockets could prove a disadvantage when it comes to scanning the surroundings. To compensate for this, Owls have incredibly flexible necks that enable the birds to rotate their heads 270 degrees in either direction, or even turn them upside down.The eyes are also adapted for seeing at low light intensities, with large pupils and a retina (the layer of light-receptive cells at the back of the lens) endowed with a greater proportion of cells than diurnal birds. These extremely sensitive cells, called rods, enable the Owl to see only in monochrome. Although Owls' eyes are undoubtedly more acute at low light levels than our own, it is probably only by a factor of three or four times that they differ. An Owl's eyes are protected by a nictitating membrane which can be closed at will. The motion of the membrane removes dust and debris from the surface of the eye.The ears of an Owl are concealed by feathering at the margins of the facial disc. The openings of the ears are very large and they are also placed asymmetrically - one higher than the other when the Owl's face is viewed head on. This heightens the bird's ability to pinpoint a sound source, both in terms of direction and of distance. All Owls have relatively long legs and large feet which are equipped with fearsome talons. It is these that enable the bird to capture the prey; the grip and the piercing bite of the talons are often enough to deliver a fatal blow along with the first strike. Under normal circumstances three toes are carried facing forward with one facing backward, and this is sufficient for perching. At times, however, the outer toe can be reversed and this greatly enhances the prey-capturing capability of the feet. Like diurnal birds of prey, all Owls have a long, hook-tipped beak. This is sometimes used to kill prey held in the talons, but is more often used to carry prey in flight or to tear portions off larger quarry prior to swallowing or feeding to young. Much of the beak is concealed by feathering and therefore can appear quite small. When opened wide for swallowing, however, a huge gape is revealed, more than enough for most Owl species to swallow a small mammal whole. Many Owl species, even surprisingly large-sized ones, feed almost exclusively on small mammals, and this is clearly the feeding strategy that suits the group as a whole. There are, however, a number of notable exceptions. Many of the smaller Owls, especially those from warmer climates, specialise in catching insects while, at the other extreme, Eagle Owls have been known to tackle prey the size of a small deer. Perhaps the most unusual diet is found in the Fishing Owls and Fish Owls which, as their names relate, capture fish. Among the diurnal birds of prey some species, notably vultures, have specialised in feeding on carrion. There are no Owls that have adopted this way of life. Most Owls feed almost exclusively on the prey to which they are best adapted and show little variation in their feeding preferences. However, species which have a particularly wide global distribution are sometimes more adaptable. Owls hunt in two primary ways. Species such as Barn Owls and Short-eared Owls often quarter areas of grass with slow, buoyant flight, looking and listening for the movements of rodents below. Others, such as the forest-dwelling species, prefer to perch motionless on a lookout branch, watching and listening for the tell-tale signs of prey below. Larger species of Owls often swallow their prey whole or divide it into more-or-less intact portions. The food is eaten, but the bones, fur or feathers of the victims are indigestible. From time to time Owls regurgitate pellets containing said matter, and this frequent function is often performed at a regular site. Pellets can, therefore, be collected and a good assessment of the Owl's diet can be made. In order to examine a pellet, soak it for a short while in water before teasing it apart. The most interesting part of the hornbill's life cycle is the unusual way in which the adults raise their young. In the summer months the pair will seek out a natural nesting hole in the trunk or branch of a large tree. After mating (usually in October/November in this area), the female enters the hole and lays 3 - 4 eggs. During this time, the male will bring mud and packing material to the female and she proceeds to seal the hole from the inside, leaving only a very small longitudinal slit. She then moults all her primary and tail feathers and in this semi-naked state begins to brood the eggs. Brooding usually lasts for a period of 24 days. The male flies backward and forward, ferrying insects to the female, and when the young hatch, his workload becomes exhausting. Eventually, approximately 20-22 days after the first egg has hatched, the mother breaks down the mud and emerges with newly-grown flight feathers, to help her frantic and exhausted mate feed their perpetually hungry, squabbling brood. The youngsters then reseal the entrance by themselves. About 44-47 days after they have hatched, the young hornbills leave the nest. The advantage of sealing the hole is of course protection from nest-robbing snakes, birds and even mammals, such as monkeys, baboons and genets. However, should anything happen to the male, the flightless female and her helpless brood are doomed to a lingering death from starvation. World: Widespread in Africa south of 16?lthough mostly absent from the arid areas of eastern Somalia and in the sw of the continent. Kenya: Found near any water containing fish and so present across most of the country except for the arid north east. 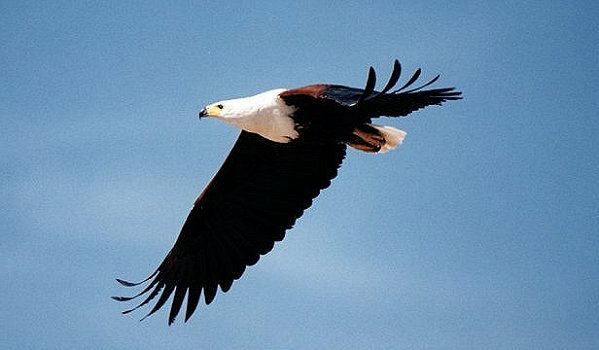 The African Fish Eagle has a very distinctive call which is one of the distinctive sounds of Kenya (once heard it is never forgotten). It is particularly common in and around some of the Rift Valley lakes. Although, as its name suggests, it feeds extensively on fish, in some areas (eg Lake Bogoria) it preys on flamingos and other water birds. It is also known to eat carrion and is classified as a kleptoparasite ie it steals prey from other birds. Goliath Herons are known to lose a percentage of their catch to Fish Eagles. One of the "mustn't miss" opportunities on a visit to Lake Baringo is a trip on the lake with an experienced boatman and birder. This is particularly true if you're lucky enough to go out with someone who knows the Fish Eagles well enough to call them down to feed on freshly caught fish (bought from a fisherman in passing) right next to the boat! This individual was photographed at Lake Baringo, in January 1998. Vultures are large birds of prey closely related to hawks and eagles. They are divided into New World vultures and Old World vultures, both belonging to the order Falconiformes. The New World vultures, in the family Cathartidae, consist of seven species in five genera; the Old World vultures belong to the subfamily Aegypiinae, family Accipitridae. The head and neck of vultures from both families are usually bare except for a thin covering of down. Both groups have weak feet, adapted more for running than for clutching. The bills of New World vultures are relatively weak, whereas the Old World vultures generally have much stronger beaks. The New World vultures are distributed in North and South America. They include the Turkey Vulture, Cathartes aura; Black Vulture, Coragyps atratus; and California Condor, Gymnogyps californianus. 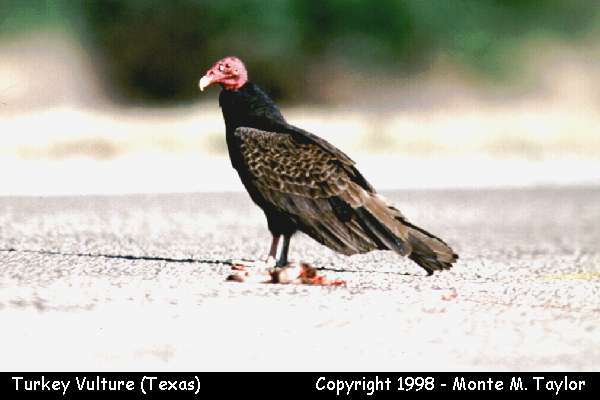 The Turkey Vulture is common in the United States. Its keen sense of smell is vital for finding carrion. Black Vultures, a more southern species, lack the graceful flight pattern of the Turkey Vulture and depend more on keen eyesight than sense of smell. The California Condor, along with the Andean Condor, Vultur gryphus, is one of the world's largest flying birds. Because of many years of persecution, the California Condor is in danger of extinction; an estimated 40 to 60 birds exist today. Old World vultures inhabit the warmer parts of Europe, all of Africa, and the drier parts of Asia. They are most common in mountainous or open country and are seldom found in forests or in areas with high rainfall. All are carrion eaters except for the Palm Nut Vulture, Gyphohierax angolensis, which feeds principally on the fruit of the oil palm. The Egyptian Vulture, Neophron percnopterus, may be the most common vulture in the Old World. It eats carrion, eggs, or insects, and often scavenges in settlements. Strikingly crested bird found from southern Europe and Africa to southeastern Asia, the sole member of the family Upupidae of the roller order, Coraciiformes. 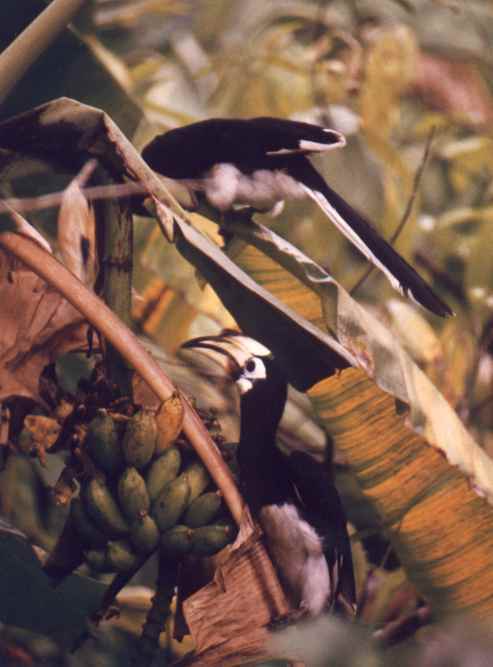 About 28 centimetres (11 inches) long, it is pinkish brown on the head and shoulders, with a long, black-tipped, erectile crest and black-and-white barred wings and tail. 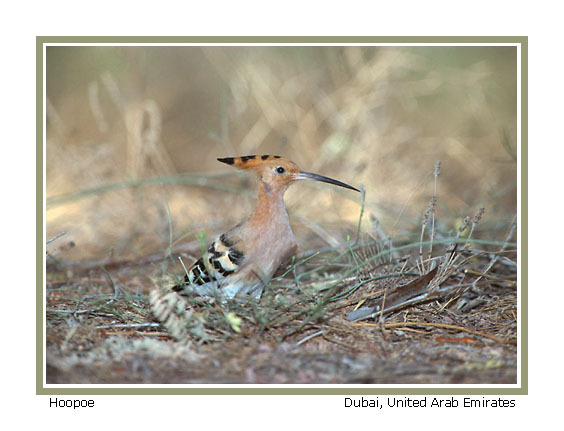 The hoopoe takes insects and other small invertebrates by probing the ground with its long, downcurved bill. Some systems of classification recognize one other species (U. africana), found from Ethiopia to South Africa, and northern India.